A-HOTEL.com - Luxury and cheap accommodation in Teplovka, Russia. Prices and hotel, apartment booking in Teplovka and surrounding. 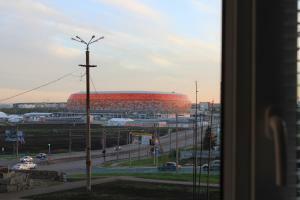 Set 3 km from Mordovia Arena, Гостиный дом "Райское местечко" provides accommodation and free WiFi in Saransk. Each of the units features a kitchen and a living room with dining area and a flat-screen TV.